I’ve occasionally alluded (often by “procrastinating by decluttering” sorts of tweets, or my posts here; here and here; here; and here) that I’m one of those people who enjoy decluttering and organizing things. This may, too, be why I design, and especially the types of designing I do: going from chaos to order, from a myriad of choices and ideas to a final design. Something to ponder. We live in a small house (approx 916 square feet). We love our little house (read the intro for California Revival Knits to hear me rhapsodize about it) but, well, space is limited. We have our bedroom, a second bedroom that is the cats’ room (filled with Dave’s books and a few other things besides the cats), the bathroom, the living room, the dining room including its nook, the kitchen, and the laundry area/breakfast nook (used for laundry & computer area). Oh, and a small hallway. Okay, before anyone asks: the cats get their own room because they’re indoor only cats and Rigel has a dog door and though Meggie and Cali have no interest in going outside Obi definitely does and he knows how to use the dog door so he must not have access to the dog door & thus they all must stay in their own room. When we close Rigel’s dog door in the evening the cats come out. Considering whenever I look in at them they’re all cuddled up in their basket I don’t think they mind tremendously. Rigel sleeps in his kennel in the closet (that sounds vaguely Harry Potter under-the-stairs to me, but he (Rigel) often puts himself to bed, so apparently he doesn’t mind). The cats sleep with us. In a perfect world, we’d have another bathroom, and a third bedroom that could really function as a guest bedroom…as well as a studio, or at least storage for all my yarn stuff. Considering we’ve no interest in moving, we’re working with what we have. I abhor clutter. I really do. It offends me. I’m a big believer in William Morris’ quote Have nothing in your houses that you do not know to be useful or believe to be beautiful. Clutter, to me, includes excess pieces of furniture. It includes excess knick knacks. It absolutely includes things that serve no purpose and/or just don’t get used. It’s grown to include books I like, but simply don’t refer to or don’t re-read (I’m happy to re-read favorite books). It includes perfectly good yarn that I know I won’t use. Oh, that’s a hard one. Regardless, we have a carefully curated collection of decorative stuff. 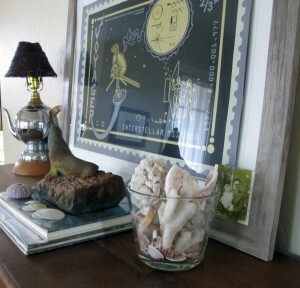 Seashells that we’ve collected on various trips, corralled into jars or vases. Pretty rocks and minerals either displayed alone, in a bowl, or in one of our many bookcases. A small collection of Zuni fetishes. A shed antler I found on a visit to an exotics game ranch in Texas while in vet school, that the owner graciously allowed me to keep. I’ve massively downsized my book collection, both fiction & nonfiction. In fact, the only book collection that’s grown is my knitting library. I finally found a new home (with one of the teachers where Dave teaches) for the cross stitch & rug hooking supplies I’d been keeping, thinking I could someday use them. I never did use them. I passed on some natural dyes to Jaala (who’s starting to dye yarn now! gorgeous yarn!). I know I have some other art & craft supplies that I should re-home, but I’m working myself up for that. Furniture-wise, if something gets added, something has to go, or at least things get massively rearranged. We’re balancing having pieces that we use & need with not having too much. In the next post, I’ll give you an overview of how I organize my knitting. In the meantime, here are some links on organizing your knitting supplies. If you know of any others that you particularly like, let me know in the comments! 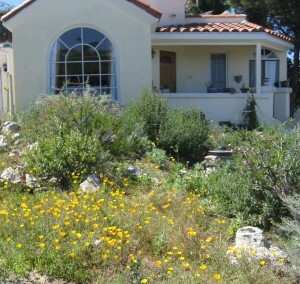 Tina from Peacefully Knitting just did a lovely room re-do; read about it here. How to Organize Your Knitting Supplies Common sense, basic info. Evernote I love Evernote. Personally, I don’t use it the same way for knitting stuff (though I do use it to collect urls for pertinent links), but I do use it in other ways for designing, tech editing, etc. That’s a blog post in itself. Delightful Order Obviously, a kindred spirit. I particularly like the re-purposing of the dresser. Loopy Ewe Stash storage. Love the glass cabinet. My yarn in my bookcase doesn’t stay as nicely stuffed, but maybe I just need to stuff more in there so it’s self-supporting. Here is Sheri’s post on needle storage. Read the comments, too: lots of good info. This is an old, looks-to-be-abandoned blog, but it’s all about organizing knitting with various contributors. Peace of Mind Basic info. On Ravelry: Organized Knitting etc Club, Home Organizing, Storage Ideas. There are others but these seem to be the busiest/ most active.